Tipard Mod Converter for Mac is poised to convert your. Mod files to FLV Mac for YouTube, Myspace and Google Video, etc, as well as to your portable player. Moreover, this first yet easy-to-use Mac Mod Converter can convert TOD, MPEG, MPG, MPV, MP4,VOB files and HD TS, HD MTS, HD M2TS, etc to AVI/MPG/WMV/MP4 and other popular video/audio formats. Trim, crop, merge, watermark video clips and adjust video effects. ...... enjoy it on your computer, iPod, Touch, Nano, iPhone, PSP, Zune, Creative Zen and other Portable Devices. 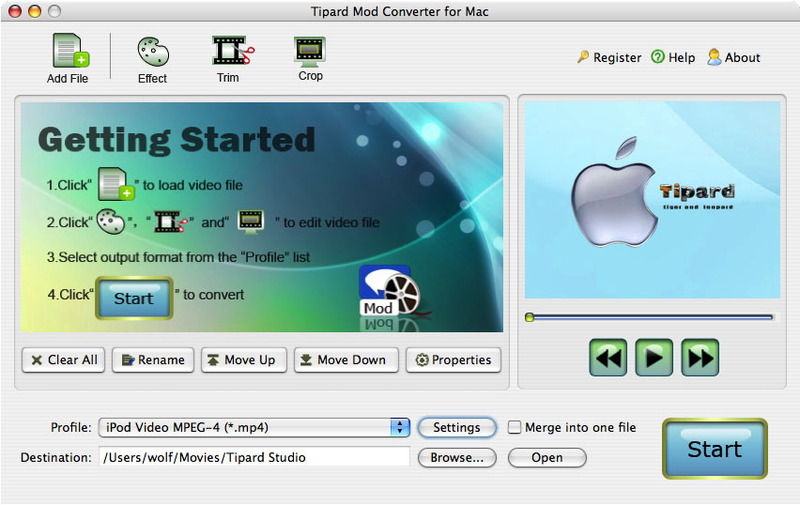 On top of its overwhelmingly conversion speed and multiple format conversion, Tipard Mod Converter for Mac offers Mac users the ability to set encoding parameters including resolution, encoder, frame rate, video bitrate to get the best video quality. Even crop or trim your video, as well as the function of merge several selected titles or chapters into one file. 2. Professional Mod Converter for Mac to convert Mod to all popular video formats for Mac. 3. Convert Mod to almost portable players. 4. Trim your video clips. Qweas is providing links to Tipard Mod Converter for Mac 3.6.22 as a courtesy, and makes no representations regarding Tipard Mod Converter for Mac or any other applications or any information related thereto. Any questions, complaints or claims regarding this application Tipard Mod Converter for Mac 3.6.22 must be directed to the appropriate software vendor. You may click the publisher link of Tipard Mod Converter for Mac on the top of this page to get more details about the vendor.